My combination skin is well behaved most of the times. There are times when my skin doesn’t love everything I introduce in my skincare. Sometimes, my skin gets clogged and lack hydration. Especially, my night skincare routine, I am not fond of applying rich creams. I like light-weight product formulations that delivers boost of hydration to my skin. Something that’s non-greasy and very soothing on skin. There comes ‘water-gel moisturizers’ .They’re watery, non-greasy, and completely absorb in just a few minutes. 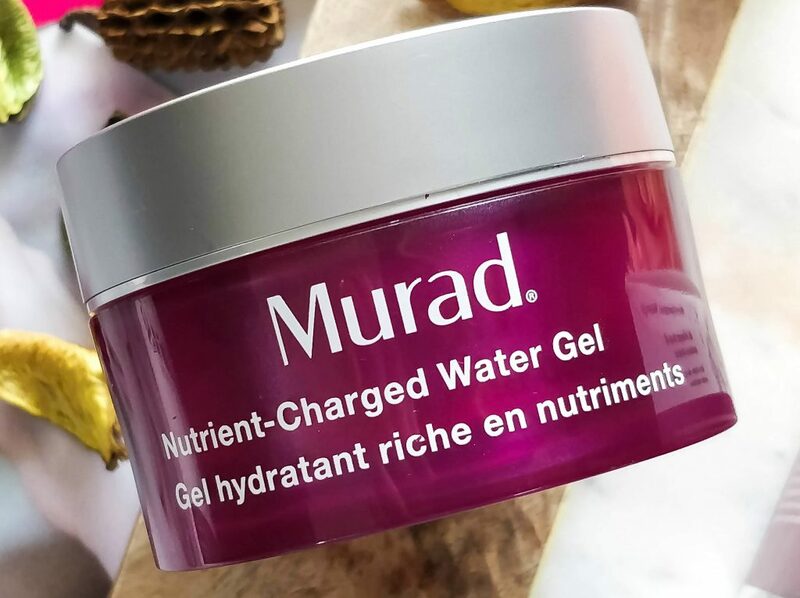 Recently I got introduced to this Murad Nutrient-Charged Water Gel that applies comfortably and hydrate skin to the fullest. 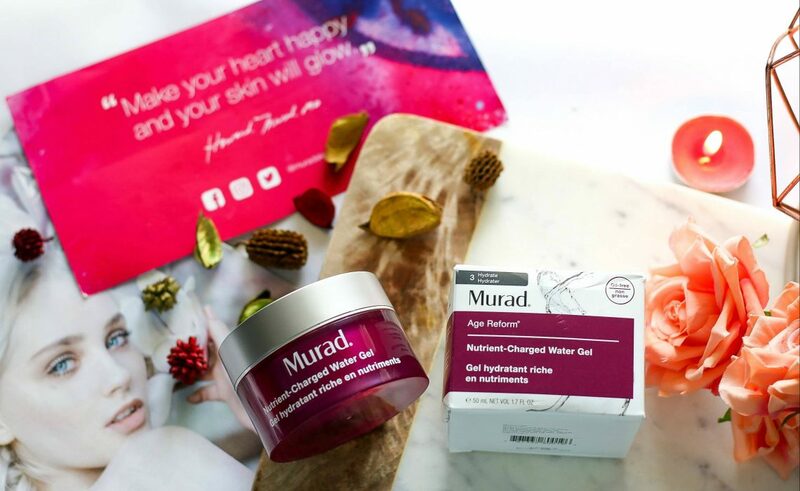 Murad Nutrient-Charged Water Gel – £50/$60 is a lightweight, oil-free gel moisturizer with cumulative hydration-release technology that locks moisture to skin and increases retention for up to five days. 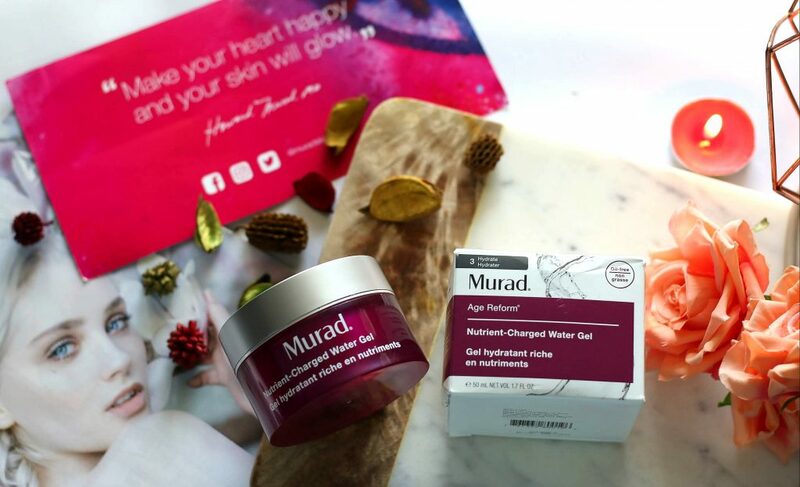 If you have a dull, dry or sensitive or irritated skin – You are going to love this wonderful water gel moisturizer from Murad. Packaging – You get 50 ml / 1.7 oz of product and it comes in this acrylic jar with a spatula. There is nothing fancy about the packaging. I use spatula to take the product every time I want to use it. But, generally, jar packaging is not good for moisturizers considering It’s getting exposed to elements that downgrade the product efficacy. After cleansing and toning your skin, You can apply a tiny bit amount of Nutrient-Charged Water Gel provides enough hydration for wearing alone, or underneath your SPF and makeup. I love to use it both day as well as night. This product is cruelty-free, and formulated without gluten and animal-derived ingredients. -Vitamins B3, B5, B6, B9, and E: Help alleviate dryness, provide anti-wrinkle benefits, and soothe skin. -Silicon, Iron, Zinc, Copper, and Magnesium: Support healthy-looking skin tone and texture. -Oligopeptide-1, Oligopeptide-2, Polypeptide-1, Polypeptide-9, and Polypeptide-11: Help restore damaged skin barrier. 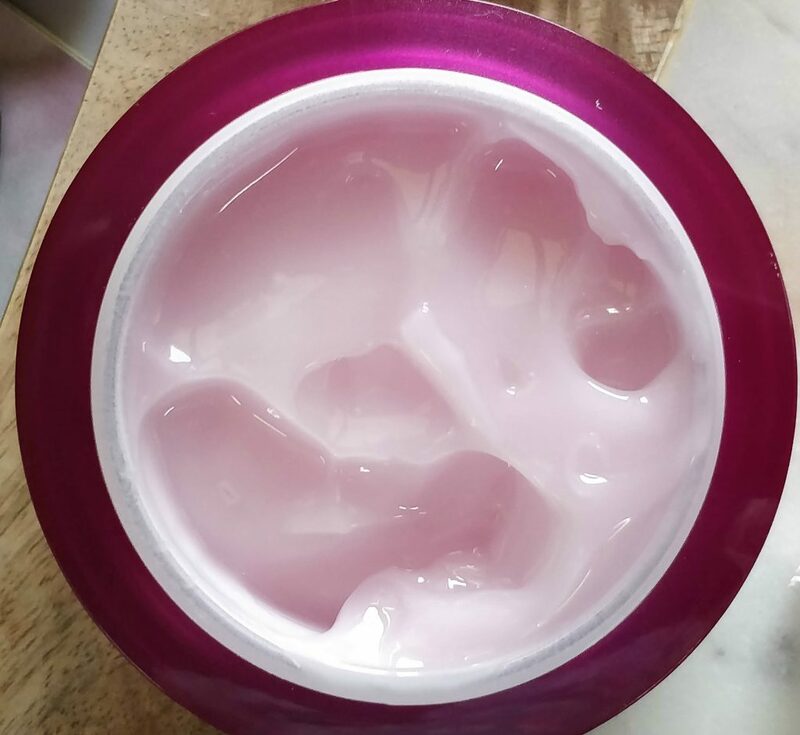 Water, Dimethicone, Glycerin, Propanediol, Saccharide Isomerate,Polymethylsilsesquioxane/Silica Crosspolymer, Hydroxyethyl Acrylate/Sodium Acryloyldimethyl Taurate Copolymer, Hydroxyethyl Urea, Isononyl Isononanoate, Ceramide NP, Ceramide AP, Ceramide EOP, sh-Oligopeptide-1, sh-Oligopeptide-2, sh-Polypeptide-1, sh-Polypeptide-9, sh-Polypeptide-11, Saccharomyces/Zinc Ferment, Saccharomyces/Copper Ferment, Saccharomyces/Magnesium Ferment, Saccharomyces/Iron Ferment, Saccharomyces/Silicon Ferment, Leuconostoc/Radish Root Ferment Filtrate, Bacillus/Folic Acid Ferment Extract, Trehalose, Taurine, Serine, Tocopheryl Acetate, Calcium Pantothenate, Niacinamide, Phytantriol, Acetyl Glutamine, Urea, Cholesterol, Yeast Amino Acids, Phytosphingosine, Inositol, Betaine, Lecithin, Sodium Ascorbyl Phosphate, Sodium Hyaluronate, Pyridoxine HCl, Sucrose, Algin, Pullulan, Maltodextrin, Polysilicone-11, Glyceryl Polyacrylate, Decyl Glucoside, Pentylene Glycol, Hexylene Glycol, Caprylyl Glycol, Butylene Glycol, Ethylhexyl Isononanoate, Polyisobutene, Silica, Sodium Starch Octenylsuccinate, PEG-7 Trimethylolpropane Coconut Ether, Trisodium Ethylenediamine Disuccinate, Disodium Phosphate, Potassium Phosphate, Carbomer, Xanthan Gum, Sodium Lauroyl Lactylate, 1,2-Hexanediol, Phenoxyethanol, Ethylhexylglycerin, Fragrance, Red 33 (CI 17200), Red 4 (CI 14700). To prove the effectiveness of this product, Murad issued the Water for Days Challenge. Wear your Water- apply Nutrient-Charged Water Gel AM and PM. It locks in water for plumper, smoother skin. It feels velvety smooth when applied on skin. It has a very mild fragrance. I like it. I have using it in harsh winters and I absolutely love how hydrating it is on the skin and it left my skin supple and plumped. It’s even perfect for summers and it stays well under makeup. It’s oil-free and water based, and it layers really well with other skincare. 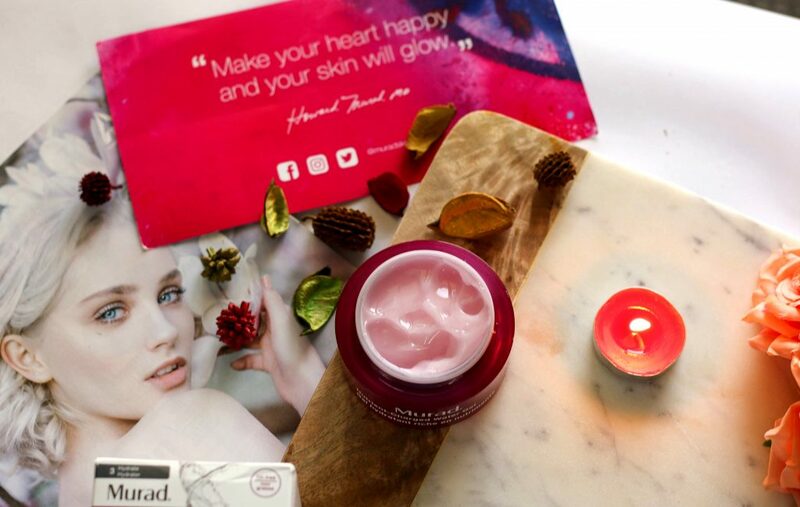 Overall, Murad Nutrient-Charged Water Gel has been amazing on my skin. While slathering a teeny amount on my skin, It’s just hydrating and quickly gets absorbed into the skin leaving your skin plumped, smooth and hydrated. It smells great and is perfect to be used AM as well as PM. Texture is very light-weight, bouncy/cushiony, non sticky, and is water-gel based that hydrates the skin very well. Has a mild floral scent to it, not overpowering at all. Feels good on skin. Great all day hydrating moisturizer and sits well under makeup. It takes away dry patches on my face. 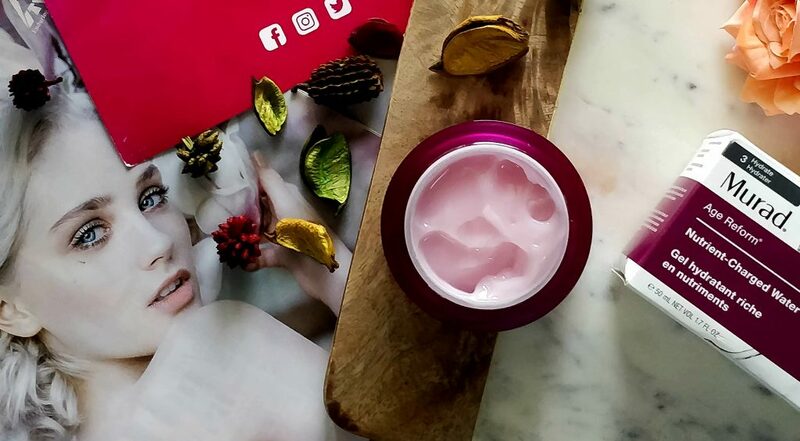 If you have extremely dry skin and if you don’t like fragrance in your moisturizer – You might want to try a more rich cream moisturizer. 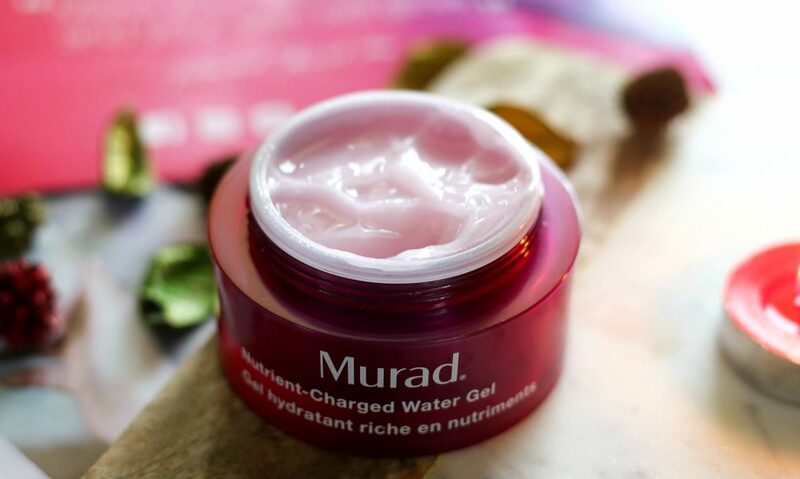 For normal – sensitive skin – Murad Nutrient-Charged Water Gel is perfect.